PUT it down to some monarchy madness or delayed cabin fever from the convict journey from the motherland, but I am off to see the Queen. My seven-year-old is pretty excited - probably more so because he doesn't have to go to school. When the Queen was last in Queensland, I had the official Royal invite to join a select group of journalists (probably ones who had written nasty things about her in the previous week) for afternoon tea at a posh Brisbane hotel. This time, I'm joining the commoners all the way. We're even taking the public cattle train for goodness sake. I'm not sure what Her Majesty will think about that. But I've heard rumours she could be taking public transport, in the form of a City Cat herself down the river. To be honest, I'd rather see her steaming down the river aboard the Royal yacht Britannica, just like she did in the good old days. I'm jumping on board a Royal boat myself once down in Brisbane - the Kookaburra Queen. I was going to try to survive the Southbank crush but the thought of losing young Sam in the crowd was too much to bear. So instead, we are going to cruise past the Queen, hopefully getting close enough for Her Majesty to see Sam's royal wave. I hope she does, he's been practising vigorously - and no doubt will be doing so on the train down this morning. 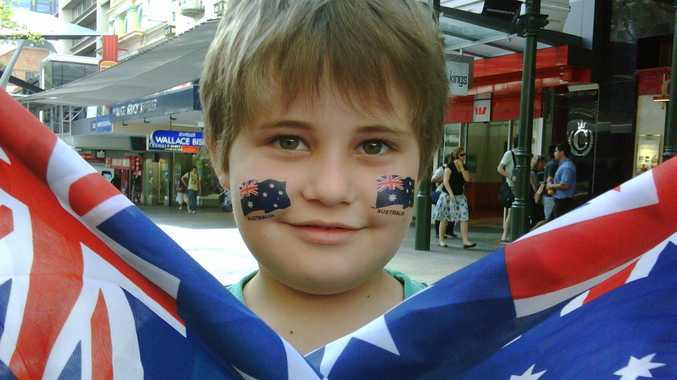 We reckon big smiles, the wave of an Aussie flag - and a little boy's face covered in Aussie tattoos might be enough to get her attention. Either that or I could yell out the Duke's description of Twin Waters Resort just to jog his memory of our last encounter. Royal protocol means I can't, even 10 years on, reveal what he said, but it was pretty funny. While I'm neither a Royalist or a Republican, I reckon the Queen deserves a warm Queensland welcome today. Anyone who get off a plane after a 22 hour flight and hit the ground running at 85 years of age deserves a curtsy or two - even if our PM can't bring herself to do it. As one UK paper rightly dubbed her, she is our 'Marathon Ma'am!". Her Majesty The Queen and His Royal Highness The Duke of Edinburgh will visit Brisbane for one day only on Monday 24 October. • 1.30pm - Luncheon hosted by the Governor of Queensland (private event). 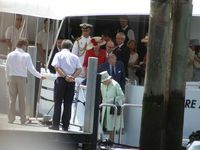 Beginning at Bretts Wharf and ending at South Bank, The Queen and The Duke of Edinburgh will make their way down the Brisbane River on a river cruise, seeing first hand some of the areas affected by the January floods. People will be able to line the banks of the Brisbane River to welcome The Queen and The Duke of Edinburgh as they pass by. The river cruise will commence at 11:30 am. People will then have another opportunity to see The Queen and The Duke of Edinburgh as they make a short public walk through the Cultural Forecourt at South Bank on their way to a special private reception at the Queensland Performing Arts Centre (QPAC). Hosted by the Premier of Queensland, the special reception at QPAC will acknowledge the emergency personnel, volunteers, and those affected by the natural disasters during the summer of 2010/11. Finally, The Queen will officially open Rain Bank, an initiative to improve water efficiency throughout the Parklands at Rainforest Green. People can gather in designated areas throughout South Bank. The public walk will commence at 12:20 pm. The Queen will officially open Rain Bank at Rainforest Green at 1.15 pm. 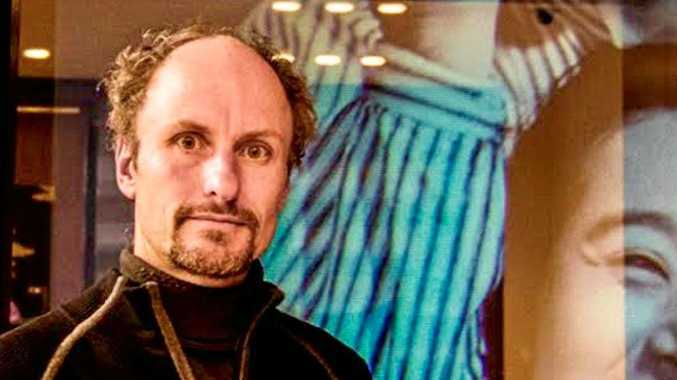 People will also have the opportunities to view the proceedings through live public viewing screens at the Cultural Forecourt and Rainforest Green. Some pedestrian access will be restricted within the Parklands along with some additional road closures. Some road closures will be in place around Brisbane City during the Royal visit. The Brisbane City Council and the Queensland Police Service advise that these closures and traffic redirections will cause moderate to significant delays. Police officers and traffic controllers will be present to assist motorists, buses, and pedestrians. • Unnamed road underneath Captain Cook Bridge leading to Kangaroo Point cliffs. • Grey St, South Brisbane between Peel St and Glenelg St (inbound and outbound traffic). • Little Stanley Street between Glenelg St and Tribune St.
• Other streets in the area that will be affected include: Melbourne Street, Russell Street, Merivale Street and the areas surrounding the Cultural Centre. • Southbound traffic will be detoured via Peel St; Cordelia St; Glenelg St and northbound traffic will be detoured via Glenelg St; Merivale St; Peel St.
• Pedestrian and cycle traffic will also be affected on the Go Between Bridge, the Goodwill Bridge, as the footways on the Story Bridge during the event. • Inner City Bypass eastbound at Abbotsford Rd exit. • Motorists will be advised to use Sandgate Rd; East-West Arterial Rd and Nudgee Rd as detour route. The Queen and The Duke of Edinburgh's visit coincides with The Queen's attendance at the Commonwealth Heads of Government Meeting (CHOGM) in Perth. While in Australia, The Queen will also visit Canberra and Melbourne. This is the first visit to Queensland by The Queen and the Duke of Edinburgh since 2002 when they attended CHOGM at Coolum and visited Brisbane and Cairns. The Duke of Edinburgh also visited Roma. 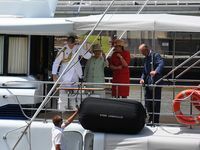 The 2011 visit will present a special opportunity for thousands to see The Queen and The Duke of Edinburgh and give them a warm Queensland welcome.